The first Boxer was registered with NZKC in 1950 and the first Boxer Champion gained her title in 1951. By March 1955 Boxers had risen to 8th place with 86 registrations the previous year and the need for a Breed Club was apparent. In May the inagural meeting of The Boxer Club was held in the SPCA rooms in Auckland. 21 people attended and a further 7 financial members sent apologies so the club began with 28 financial members. It is interesting to note that only 2 of these 28 members are still active in the dog game - Boxer Club Life Member Ernie Schache, the first President of the club and now the Senior All Breeds Judge in New Zealand, and Boxer Club Life Member Philip Eggleton, also a former President of the Club now living in Australia, and still a keen Breeder of Boxers over there. A perusal of the Club's minute books and other records confirms that like many other canine organisations The Boxer Club has had it's ups and downs over the years. 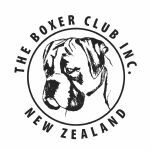 May 25 Boxer Club formed and shortly after granted recognition NZKC and Incorporation by registra of Incorporated Societies. July - 01st Boxer Bulletin produced - Editor - Mr D Benefield. August - 01st Club Event - Ribbon Parade at AKC Grounds, Judge - Mr W Saunderson. Mr Gordon Beeson elected Patron. A Ribbon Parade was held in Wellington on 13th April, Judge - Mr F Patterson. Discussions were held re forming a seperate Boxer Club in Wellington and although nothing transpired at the time, this eventually lead to the formation of The Wellington Boxer Club in 1960. By now the Club had 194 Financial Members. Three hundred Boxers were registered that year which put Boxers in 5th place overall. Association with NZKC was granted this year. The Club's first Open Show was held in conjunction with the Auckland Birthday Carnival in January, Judge - Mr Grogan. In June the first of many future Ribbon Parades was held in Hamilton. At the AGM Mr Schache resigned as President and was made the Club's first Life Member. The Boxer Club was honoured to be granted the first ever Specialist Breed Club Championship Show in NZKC History. This was held on the same day as the Dachshund Club and the first Multi-Breed Club Championship Show, March 18 Mrs Connie Wilson-Wiley, Wardrobes Boxers, England was the Judge and there were 241 entries from 81 Boxers. Overseas membership was introduced this year. A Special General Meeting was called to discuss a vote of no confidance in the President. After a considerable amount of discussion the resolution was withdrawn and the meeting closed. A few months later the President resigned. As an outcome of complaints against the Club Management made by Club Members, Championship Show Status was withdrawn by NZKC, but then later reinstated. The Championship Show was then cancelled by the President. The Championship Show (which had been held in the previous year) was again cancelled by the Club's President due to lack of entries, the result of an alledged boycott of the show. Shortly after this there was a considerable change in the Club's executive and the Club gradually recovered from the trauma of the last few years. Mr & Mrs G Beeson were elected Life Members. Mrs R Norris was elected the first lady President in the Club's history. This could well be termed 'The Year of The Boxer', as between them 5 Boxers won Best In Show at 15 All Breed Championship Shows, plus a great many Reserve Best In Shows and other In Show Awards. In addition, Dog of The Year (NZKC) was awarded to Dr & Mrs Tourelle's CH Gremlin Hey Pronto (Imp England). Mr Philip Eggleton was elected a Life Member of The Boxer Club. The late Mr Arthur Westlake became the 9th overseas judge brought out by the Club when he judged the Club's 18th Championship Show. The above article was published on a single page in The NZ Kennel Gazette in mid 1980. It was surrounded by Advertisements for various Boxer Kennels and became the forerunner of what are now known as the Breed Supplements which are published each month as a central pull out in the Gazette. The article was submitted by the then President Mr Barry Catton in April 1980. We are still going through info once we have found this the President's and Secretaries list will be updated.